This article is about the theological concept. For other uses, see Sola scriptura (disambiguation). Sola Scriptura (Latin: by scripture alone) is a theological doctrine held by some Christian denominations that the Christian scriptures are the sole infallible rule of faith and practice. While the scriptures' meaning is mediated through many kinds of secondary authority, such as the ordinary teaching offices of a denominated church, the ecumenical creeds, the councils of the catholic church, and so on - sola scriptura, on the other hand, rejects any original infallible authority other than the Bible. In this view, all secondary authority is derived from the authority of the scriptures and is therefore subject to reform when compared to the teaching of the Bible. Church councils, preachers, Bible commentators, private revelation, or even a message allegedly from an angel or an apostle are not an original authority alongside the Bible in the sola scriptura approach. Sola scriptura is a formal principle of many Protestant Christian denominations, and one of the five solae. It was a foundational doctrinal principle of the Protestant Reformation held by many of the Reformers, who taught that authentication of scripture is governed by the discernible excellence of the text as well as the personal witness of the Holy Spirit to the heart of each man. Some evangelical and Baptist denominations state the doctrine of sola scriptura more strongly: scripture is self-authenticating, clear (perspicuous) to the rational reader, its own interpreter ("Scripture interprets Scripture"), and sufficient of itself to be the final authority of Christian doctrine. By contrast, Anglicanism and Methodism, also considered forms of Protestantism, uphold the doctrine of prima scriptura, with scripture being illumined by tradition, reason, and in Methodism, experience as well, thus completing the four sides of the Wesleyan Quadrilateral. The Eastern Orthodox Church holds that to "accept the books of the canon is also to accept the ongoing Spirit-led authority of the church's tradition, which recognizes, interprets, worships, and corrects itself by the witness of Holy Scripture". The Catholic Church regards the apostolic preaching and writing (referred to as tradition and scripture respectively) as equal since they believe that many of their traditions also came from the Apostles. The Catholic Church describes this as "one common source ... with two distinct modes of transmission", while some Protestant authors call it "a dual source of revelation". Sola scriptura is one of the five solae, considered by some Protestant groups to be the theological pillars of the Reformation. The key implication of the principle is that interpretations and applications of the scriptures do not have the same authority as the scriptures themselves; hence, the ecclesiastical authority is viewed as subject to correction by the scriptures, even by an individual member of the church. Sola scriptura, however, does not ignore Christian history, tradition, or the church when seeking to understand the Bible. Rather, it sees the church as the Bible's interpreter, the regula fidei (embodied in the ecumenical creeds) as the interpretive context, and scripture as the only final authority in matters of faith and practice. As Luther said, "The true rule is this: God's Word shall establish articles of faith, and no one else, not even an angel can do so." Lutheranism teaches that the Bible of the Old and New Testaments is the only divinely inspired book and the only source of divinely revealed knowledge. [a] Scripture alone is the formal principle of the faith in Lutheranism, the final authority for all matters of faith and morals because of its inspiration, authority, clarity, efficacy, and sufficiency. Lutheranism teaches that the Bible does not merely contain the Word of God, but every word of it is, because of verbal inspiration, the word of God. Most Lutheran traditions acknowledge that understanding scriptures is complex given that the Bible contains a collection of manuscripts and manuscript fragments that were written and collected over thousands of years. For example, the Evangelical Lutheran Church in America teaches that "Lutheran Christians believe that the story of God’s steadfast love and mercy in Jesus is the heart and center of what the Scriptures have to say." As Lutherans confess in the Nicene Creed, the Holy Spirit "spoke through the prophets". The Apology of the Augsburg Confession identifies "Holy Scripture" with the Word of God and calls the Holy Spirit the author of the Bible. Because of this, Lutherans confess in the Formula of Concord, "we receive and embrace with our whole heart the prophetic and apostolic Scriptures of the Old and New Testaments as the pure, clear fountain of Israel". The apocryphal books were not written by the prophets, by inspiration; they contain errors, were never included in the Palestinian Canon that Jesus used, and therefore are not a part of scripture. The prophetic and apostolic scriptures are said by the Lutheran church to be authentic as written by the prophets and apostles, and that a correct translation of their writings is God's Word because it has the same meaning as the original Biblical Hebrew and Koine Greek. A mistranslation is not God's word, and no human authority can invest it with divine authority. "I saw another angel fly in the midst of heaven, having the everlasting gospel to preach..." This illustration is from the title page of Luther's Bible. Scripture, regarded as the word of God, carries the full authority of God in Lutheranism: every single statement of the Bible calls for instant, unqualified and unrestricted acceptance. Every doctrine of the Bible is the teaching of God and therefore requires full agreement. Every promise of the Bible calls for unshakable trust in its fulfillment; every command of the Bible is the directive of God himself and therefore demands willing observance. What is said here of "every statement of the Bible" does not represent the faith of all Lutherans: a 2001 survey showed that 72 percent of members of the Evangelical Lutheran Church in America do not accept that everything in the Bible is literal, but that it may contain scientific or historical errors or describe events symbolically. 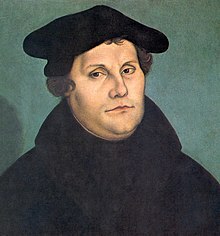 Lutheranism teaches that the Bible presents all doctrines and commands of the Christian faith clearly; that God's word is freely accessible to every reader or hearer of ordinary intelligence, without requiring any special education. It also teaches that readers must understand the language God's word is presented in, and not be so preoccupied by contrary thoughts so as to prevent understanding. It teaches that, consequently, no one needs to wait for any clergy, and pope, scholar, or ecumenical council to explain the real meaning of any part of the Bible. Luther's translation of the Bible, from 1534, with four books placed after those Luther considered, "the true and certain chief books of the New Testament"
Lutheranism teaches that scripture is united with the power of the Holy Spirit and with it, not only demands, but also creates the acceptance of its teaching. This teaching produces faith and obedience. Scripture is not a dead letter, but rather, the power of the Holy Spirit is inherent in it. Scripture does not compel a mere intellectual assent to its doctrine, resting on logical argumentation, but rather it creates the living agreement of faith. The Smalcald Articles affirm, "in those things which concern the spoken, outward Word, we must firmly hold that God grants His Spirit or grace to no one, except through or with the preceding outward Word". Lutheranism teaches that The Bible contains everything that one needs to know in order to obtain salvation and to live a Christian life. There are no deficiencies in scripture that need to be filled with by tradition, pronouncements of the Pope, new revelations, or present-day development of doctrine. Chapter 1, Section VII. All things in Scripture are not alike plain in themselves, nor alike clear unto all; yet those things which are necessary to be known, believed, and observed, for salvation, are so clearly propounded and opened in some place of Scripture or other, that not only the learned, but the unlearned, in a due use of the ordinary means, may attain unto a sufficient understanding of them. In the Wesleyan Quadrilateral, experience is an additional source of authority. 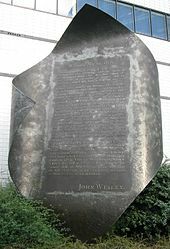 Pictured is a memorial to John Wesley's own experience of the New Birth and Assurance. Sola scriptura may be contrasted with prima scriptura, which holds that, besides canonical scripture, there are other guides for what a believer should believe, and how he or she should live. Examples of this include the general revelation in creation, traditions, charismatic gifts, mystical insight, angelic visitations, conscience, common sense, the views of experts, the spirit of the times or something else. Prima scriptura suggests that ways of knowing or understanding God and his will, that do not originate from canonized scripture, are in a second place, perhaps helpful in interpreting that scripture, but testable by the canon and correctable by it, if they seem to contradict the scriptures. Sola scriptura rejects any original infallible authority, other than the Bible. In this view, all secondary authority is derived from the authority of the scriptures and is therefore subject to reform when compared to the teaching of the Bible. Church councils, preachers, biblical commentators, private revelation, or even a message allegedly from an angel or an apostle are not an original authority alongside the Bible in the sola scriptura approach. The idea of the singular authority of scripture is the motivation behind much of the Protestant effort to translate the Bible into vernacular languages and distribute it widely. Protestants generally believe each Christian should read the Bible for themselves and evaluate what they have been taught on the basis of it. In the Roman Catholic and Eastern Orthodox Church, both of which teach that authoritative doctrine can also come from tradition, have been more active in translating them as well as the Bible into the vernacular languages. 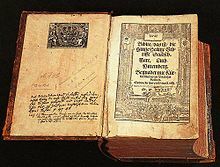 Contrary to a common polemic of the Reformation, many German translations of the bible existed before Martin Luther. Traditions of these non-Protestant churches include the Bible, patristic, conciliar, and liturgical texts. Prior to the Protestant movement, hundreds of vernacular translations of the Bible and liturgical materials were translated throughout the preceding sixteen centuries. Some Bible translations such as the Geneva Bible included annotations and commentary that were anti-Roman Catholic. Before the Protestant Reformation, Latin was almost exclusively utilized in Latin Rite Catholic Churches, but was understood by only the most literate. According to sola scriptura, the church does not speak infallibly in its traditions, but only in scripture. John Wesley stated in the 18th century, "In all cases, the Church is to be judged by the Scripture, not the Scripture by the Church." For this reason, sola scriptura is called the formal cause or principle of the Reformation. Protestants argue that the scriptures are guaranteed to remain true to their divine source—and thus, only insofar as the church retains scriptural faith is it assured of God's favour. They further assert that, if the church were to fall away from faith through scripture (a possibility Roman Catholics deny but Protestants affirm), its authority would be negated. Therefore, early Protestants argued for eliminating traditions and doctrines they believed were based on distortions of scripture, or were contrary to the Bible—but that the Roman Catholic Church considered scripturally-based aspects of the Christian faith, such as transubstantiation John 6:51, the doctrine of purgatory 1 Cor 3:15 Luke 12:59 Matthew 12:32, the veneration of images or icons Numbers 21:8, and especially the doctrine that the Pope in Rome is the head of the church on earth (Papal supremacy) John 21:17. Sola scriptura is a doctrine that is not, in the words of the Westminster Confession of Faith 1.6 "expressly set down in Scripture". However, the Confession claims that it passes the second test of being part of "the whole counsel of God" because it is "deduced from Scripture" "by good and necessary consequence", citing passages such as Isaiah 8:20: "To the law and to the testimony: if they speak not according to this word, it is because there is no light in them." Jesus is also typically understood by Protestants[who?] as expressly nullifying unscriptural traditions in the (Jewish) church, when he says, for example in Mark 7:13: "thus making void the word of God by your tradition that you have handed down. And many such things you do." The Catholic Church, from which Protestants broke away, and against which they directed these arguments, did not see scripture and the sacred tradition of the faith as different sources of authority, but that scripture was handed down as part of sacred tradition (see 2 Thessalonians 2:15, 2 Timothy 2:2). Accepted traditions were also perceived by the church as cohesive in nature. The proper interpretation of the scriptures was seen as part of the faith of the church and seen indeed as the manner in which biblical authority was upheld (see Book of Acts 15:28–29). The meaning of scripture was seen as proven from the faith universally held in the churches (see Phil. 2:1, Acts 4:32), and the correctness of that universal faith was seen as proven from the scriptures and apostolic sacred tradition (see 2 Thes. 2:15, 2 Thes. 3:6, 1 Corinthians 11:2). The Biblical canon itself was thus viewed by the church as part of the church's tradition, as defined by its leadership and acknowledged by its laity. The Catholic Dei verbum and the papal encyclicals Providentissimus Deus by Pope Leo XIII and Divino afflante Spiritu by Pope Pius XII set out Catholic teaching on tradition versus individual interpretation. The Catholic Church teaches that Christ entrusted the preaching of the Gospel to the apostles, who handed it on orally and in writing, and according to the Catechism of the Catholic Church, "the apostolic preaching, which is expressed in a special way in the inspired books, was to be preserved in a continuous line of succession until the end of time. This living transmission, accomplished in the Holy Spirit, is called Tradition, since it is distinct from Sacred Scripture, though closely connected to it." "Sacred Tradition and Sacred Scripture make up a single sacred deposit of the Word of God in which, as in a mirror, the pilgrim Church contemplates God, the source of all her riches." For the Eastern Orthodox too, "the Holy Bible forms a part of Holy Tradition, but does not lie outside of it. One would be in error to suppose that Scripture and Tradition are two separate and distinct sources of Christian Faith, as some do, since there is, in reality, only one source; and the Holy Bible exists and found its formulation within Tradition". We affirm that inspiration was the work in which God by His Spirit, through human writers, gave us His Word. The origin of Scripture is divine. The mode of divine inspiration remains largely a mystery to us. We deny that inspiration can be reduced to human insight, or to heightened states of consciousness of any kind. Since the Catholic Church professes that apostolic tradition and scripture are both the word of God, Catholics can affirm that many of these propositions apply equally well to tradition: It is the work of the Holy Spirit, which cannot be reduced to human insight or heightened consciousness. This ties in with the question of what constitutes apostolic tradition. The Catechism of the Catholic Church states that this tradition is given "by the apostles who handed on, by the spoken word of their preaching, by the example they gave, by the institutions they established, what they themselves had received - whether from the lips of Christ, from his way of life and his works, or whether they had learned it at the prompting of the Holy Spirit". This description, while leaving room for debate and refinement, offers sufficient guidelines for evaluating which Catholic teachings are part of the apostolic tradition and which teachings come from later centuries. Despite these guidelines there is plenty of confusion on the matter among both Catholics and non-Catholics. This confusion can be seen in those who quote the work Catholic researcher James Keenan to claim that the doctrines given by apostolic tradition have changed. What Keenan actually said is that not only are there "claims of inconsistency, contradiction and even incoherence" in the church's moral teaching tradition but that "continuity with the tradition itself is not the truth guarantor of any particular teaching". He elucidates this by stating that Bernard Hoose "found that claims to a continuous teaching" by the Catholic Church "on matters of life and death, sexuality, and even crime and punishment were simply not true". Keenan makes the case that not all traditions come from the Apostles; not that there are no traditions that come from the Apostles. He also adds that Mark Jordan "examined seven medieval texts on homosexuality", found them disconnected and inconsistent, and concluded that "tradition's teaching [on the subject is] incoherent". This refers to medieval tradition and not to apostolic tradition. Keenan, however, says that studies of "manualists" such as John T. Noonan Jr. has demonstrated that, "despite claims to the contrary, manualists were co-operators in the necessary historical development of the moral tradition". Noonan, according to Keenan, has provided a new way of viewing at "areas where the Church not only changed, but shamefully did not". Following the Protestant churches' separation from the Roman Catholic Church, the relatively new idea of sola scriptura came under serious critique by the Catholic and Orthodox Christians. In his The Shape of Sola Scriptura (2001), the Reformed Christian writer Keith A. Mathison mentions several recent examples of such critics. [c] In response, Mathison distinguishes what he considers to be the true doctrine of sola scriptura from the "subjective and individualistic version" of the doctrine that most Protestants have adopted. The American Roman Catholic author and television presenter Patrick Madrid wrote that sola scriptura is self-referentially incoherent, as the Bible itself does not teach sola scriptura, and therefore the belief that the scriptures are the only source of Christian belief is self-contradicting given that it cannot be supported without extra-scriptural doctrine. In the 2008 book Catholicism and Science, the authors Peter M. J. Hess and Paul Allen wrote that sola scriptura is "inherently divisive", citing the Marburg Colloquy where Martin Luther and Huldrych Zwingli debated the real presence of Christ in the Eucharist on scriptural grounds but were unable to reach agreement on Sacramental Union. Hess and Allen argue that, when scripture is seen as the only source of infallible teaching, its interpretation is subject to fallible interpretation, and without an infallible interpreter, a certainty of Christian belief is not possible. The Roman Catholic Encyclopedia of Theology notes that, since the 27 books that make up the New Testament canon of scripture are not based on a scriptural list that authenticates them to be inspired, their legitimacy would be impossible to distinguish with certainty without appealing to another infallible source, such as the magisterium of the Catholic Church, which some have suggested assembled and authenticated this list at the Synod of Rome in AD 382 (although there is considerable debate surrounding this claim). Before this, a compiled and authenticated Bible as it is now known did not yet exist. The reference to "He shall be called a Nazarene" cannot be found in the Old Testament, yet it was "spoken by the prophets" (Matthew 2:23). This prophecy, which is considered to be "God's word", was passed down orally rather than through scripture. In Matthew 23:2–3, Jesus teaches that the scribes and Pharisees have a legitimate, binding authority based "on Moses' seat", but this phrase or idea cannot be found anywhere in the Old Testament. It is found in the (originally oral) Mishnah, which teaches a sort of "teaching succession" from Moses. In 1 Corinthians 10:4, Paul the Apostle refers to a rock that "followed" the Jews through the Sinai wilderness. The Old Testament says nothing about such miraculous movement. But, this critic writes, rabbinic tradition does. "As Jannes and Jambres opposed Moses" (2 Timothy 3:8). These two men cannot be found in the related Old Testament passage (cf. Exodus 7:8ff.) or anywhere else in the Old Testament. In the Epistle of Jude 9, a dispute is mentioned between the Archangel Michael and Satan over Moses' body, which is not mentioned elsewhere in the Bible, and is drawn from oral Jewish tradition. In the Epistle of James 5:17, when recounting the prayers of Elijah described in 1 Kings 17, a lack of rain for three years is mentioned, which is absent from the passage in 1 Kings. Armstrong argues that since Jesus and the Apostles acknowledge authoritative Jewish oral tradition, Christians can therefore not dispute oral tradition's legitimacy and authority. However, according to scripture, Jesus also challenges some Jewish oral tradition. Therefore Christians, on that basis, can dispute some of that tradition's authority, since they hold that Jesus' authority is greater. Sola scriptura continues as a doctrinal commitment of conservative branches and offshoots of the Lutheran churches, Reformed churches, and Baptist churches as well as of other Protestants, especially those who describe themselves with the slogan "Bible-believing". ^ For the traditional Lutheran view of the Bible, see Graebner 1910, pp. 3ff. For an overview of the doctrine of verbal inspiration in Lutheranism, see Lueker, Poellot & Jackson 2000b. A favorite, if overworked, image among Anglicans is that of the three-legged stool, which stands only when all three legs are in place, as a visual way to think of the Anglican view of authority. We acknowledge three sources of authority, and we manage not to fall down when all three are in place. The first and most important of these is the Bible. The Articles of Religion, a Reformation-era statement of Anglican views on questions of the day, says that the Bible "containeth all things necessary to salvation", so that nothing not found in the Bible is to be required as an article of faith. ^ Namely, Mathison cited Robert A. Sungenis, author of Not by Scripture Alone: A Catholic Critique of the Protestant Doctrine of Sola Scriptura (Santa Barbara: Queenship Publishing Co., 1997); Mark Shea, author of By What Authority? (Huntington, Indiana: Our Sunday Visitor, 1996); Clark Carlton, The Way: What Every Protestant Should Know About the Catholic Church (Salisbury, Massachusetts: Regina Orthodox Press, 1997); Patrick Madrid (editor), Surprised by Truth (San Diego: Basilica Press, 1994); Scott Hahn and Kimberley Hahn, Rome, Sweet Home (San Francisco: Ignatius Press, 1993); David Currie, Born Fundamentalist. Born Again Catholic (San Francisco: Ignatius Press, 1993); and Peter Gilquist (editor), Coming Home: Why Protestant Clergy Are Becoming Orthodox (Ben Lomond, California: Conciliar Press, 1992). ^ a b "Methodist Beliefs: In What Ways Are Lutherans Different from United Methodists?". Wisconsin Evangelical Lutheran Synod. Archived from the original on 22 May 2014. Retrieved 22 May 2014. ^ Humphrey 2013, p. 16. ^ Schmidt 2002, p. 15; Waltz 1991. ^ Nassif 2004, p. 65. ^ "Catechism of the Catholic Church, 80-81". ^ Johnson & Webber 1993, p. 43. ^ Horton, Michael (1994). "The Crisis of Evangelical Christianity: Reformation Essentials". Modern Reformation. Vol. 3 no. 2. Archived from the original on 31 July 2008. Retrieved 10 July 2008. ^ Flinn 2007, pp. 431–433. ^ Mathison 2001, p. 23. ^ Martin Luther, Smalcald Articles II, 15. ^ Engelder et al. 1934, p. 29; Graebner 1910, pp. 7ff. ^ Engelder et al. 1934, p. 26. ^ "Scriptures, Creeds, Confessions". Evangelical Lutheran Church in America. ^ "The Solid Declaration of the Formula of Concord". ^ Lueker, Poellot & Jackson 2000a. ^ a b c Engelder et al. 1934, p. 27. ^ Engelder et al. 1934, p. 27; Graebner 1910, pp. 8–9. ^ Graebner 1910, pp. 8–10. ^ Graebner 1910, pp. 8–9. ^ Graebner 1910, pp. 8–11. ^ "Bible: Literal or Inspired". The Lutheran. Archived from the original on 4 November 2012. Retrieved 13 October 2012. ^ Engelder et al. 1934, p. 29; Graebner 1910, pp. 11–12. ^ a b c Graebner 1910, p. 11. ^ a b Engelder et al. 1934, p. 28. ^ Graebner 1910, pp. 11–12. ^ Graebner 1910, p. 12. ^ "Smalcald Articles - Book of Concord". ^ Graebner 1910, p. 13. ^ a b Schmidt 2002, p. 15. ^ Lewis 2001, p. 138; Schmidt 2002, p. 15. ^ "The Works of the Rev. John Wesley". ^ Scott Windsor Sr. "Qui Locutus: Sola Scriptura Self Refuting". Retrieved 19 January 2010. ^ Orthodox Outreach, "Holy Tradition"
^ "Chicago Statement on Biblical Inerrancy, Article VII". Alliance of Confessing Evangelicals. Archived from the original on 1 November 2014. Retrieved 1 November 2014. ^ Keenan 2010, pp. 45–46. ^ Mathison 2001, p. 13. ^ Mathison 2001, pp. 13–14. ^ Madrid 2012, pp. 4–6. ^ Hess & Allen 2008, pp. 28–29. ^ Neuenzeit 1975, p. 172. ^ Armstrong 2004, pp. 43–44. Armstrong, Dave (2004). The Catholic Verses: 95 Bible Passages That Confound Protestants. Manchester, New Hampshire: Sophia Institute Press. ISBN 978-1-928832-73-7. Burkitt, F. C. (1913). "Review of The Decretum Gelasianum Examined by Ernst von Dobschütz". The Journal of Theological Studies. 14 (3): 469–471. doi:10.1093/jts/os-XIV.3.469b. ISSN 0022-5185. Retrieved 17 April 2018. Engelder, Theodore; Arndt, W.; Graebner, Theodore; Mayer, F. E. (1934). Popular Symbolics: The Doctrines of the Churches of Christendom and of Other Religious Bodies Examined in the Light of Scripture. Saint Louis, Missouri: Concordia Publishing House. OCLC 42956289. Retrieved 17 April 2018. Flinn, Frank K. (2007). Encyclopedia of Catholicism. New York: Facts on File. ISBN 978-0-8160-7565-2. Graebner, A. L. (1910). Outlines of Doctrinal Theology. Saint Louis, Missouri: Concordia Publishing House. ISBN 978-0-524-04891-7. Archived from the original on 12 July 2006. Retrieved 17 April 2018. Hess, Peter P. J.; Allen, Paul (2008). Catholicism and Science. Westport, Connecticut: Greenwood Press. ISBN 978-0-313-33190-9. Humphrey, Edith M. (2013). Scripture and Tradition: What the Bible Really Says. Grand Rapids, Michigan: Baker Academic. ISBN 978-1-4412-4048-4. Johnson, Alan F.; Webber, Robert E. (1993) . What Christians Believe: An Overview of Theology and Its Biblical and Historical Development. Grand Rapids, Michigan: Zondervan. ISBN 978-0-310-36721-5. Keenan, James F. (2010). A History of Catholic Moral Theology in the Twentieth Century: From Confessing Sins to Liberating Consciences. London: Continuum. ISBN 978-0-8264-2929-2. Lewis, Harold T. (2001). Christian Social Witness. Cambridge, Massachusetts: Cowley Publications. ISBN 978-1-56101-188-9. Lueker, Erwin L.; Poellot, Luther; Jackson, Paul, eds. (2000a). "Canon, Bible". Christian Cyclopedia. St. Louis, Missouri: Concordia Publishing House. Retrieved 17 April 2018. ——— , eds. (2000b). "Inspiration, Doctrine of". Christian Cyclopedia. St. Louis, Missouri: Concordia Publishing House. Retrieved 17 April 2018. Madrid, Patrick (2012). Envoy for Christ: 25 Years as a Catholic Apologist. Cincinnati, Ohio: Servant Books. ISBN 978-1-61636-484-7. Mathison, Keith A. (2001). The Shape of Sola Scriptura. Moscow, Idaho: Canon Press. ISBN 978-1-885767-74-5. Nassif, Bradley (2004). "Are Eastern Orthodoxy and Evangelicalism Compatible? Yes: The Evangelical Theology of the Eastern Orthodox Church". In Stamoolis, James J. (ed.). Three Views on Eastern Orthodoxy and Evangelicalism. Grand Rapids, Michigan: Zondervan (published 2010). ISBN 978-0-310-86436-3. Neuenzeit, Paul (1975). "Canon of Scripture". In Rahner, Karl (ed.). Encyclopedia of Theology: A Concise Sacramentum Mundi. London: Burns & Oates (published 1999). ISBN 978-0-86012-006-3. Schmidt, Richard H. (2002). Glorious Companions: Five Centuries of Anglican Spirituality. Grand Rapids, Michigan: Wm. B. Eerdmans Publishing. ISBN 978-0-8028-2222-2. Waltz, Alan K. (1991). A Dictionary for United Methodists. Nashville, Tennessee: Abingdon Press. Proving Inspiration refers to "sola scriptura"
Scripture and Tradition and "What's Your Authority?" argues against "sola scriptura"
Citations from the Early Church Fathers on "Sola Scriptura"